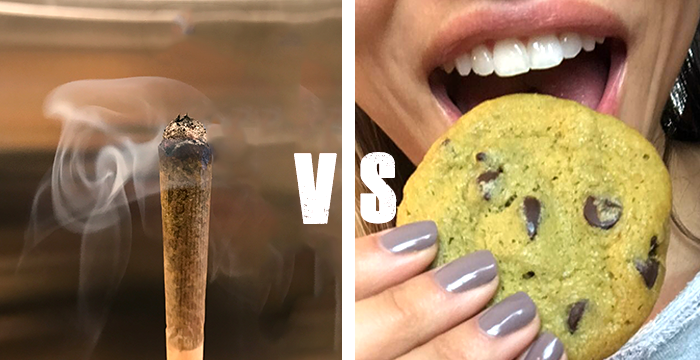 There are many therapeutic benefits to both, smoking and eating cannabis. State legislations now reflect the needs of medical marijuana patients as many states nationwide have decriminalized, and in some cases, legalized, medical marijuana. We have entered a new market of change. It is easier, now, more than ever, to have the opportunity to browse the seemingly endless display cases filled with beautiful flowers, oils, tinctures, edibles, topicals, syrups, butters, sprays, patches, and the list goes on. This article is intended to inform new patients, or even some QUESTIONING/CURIOUS vets, about the different methods of smoking while appeasing the vast uncertainties. It is important to choose a method that will accommodate your lifestyle, while being adequately accessible to maintain the holistic side-effects. Though the field of medical marijuana is a seemingly endless trove of research and hearsay, there are some things we do know about cannabis, which will be essential to keep in mind when choosing what method will work best for you. An edible generally takes longer to metabolize compared to smoking. This means that you will feel the side-effects of smoking marijuana more rapidly than ingesting an edible. This is one of the reasons why eating edibles can, at times, be an unpredictable experience. This is also why the side-effects of edibles last longer than smoking. Smoking is the fastest way to ingest cannabis. The highs of smoking will also interdependently rely on the levels of THC, CBD, and terpenes, as well as, the setting and environment. The rate times the amount of work it takes your body to process cannabis will determine the expediency of the side-effects. This formula is different for every person therefore word-of-mouth is nothing more than futile suggestions. Also, there is a mythological idea of the inherent side-effects for indica and sativa strains. We have been told over and over and over that indicas are for sleeping and sativas are for functioning in society. This idea is ingrained in our minds and the words “couchlock” and “uplifting” become a sales pitch, rather than a matter of fact. Those synonyms are seemingly untrue and limit us in discovering an effective method to treat symptoms with cannabis. That said, we also need to think of the chemical compounds that are in an edible or marijuana plant. The side-effects of ingesting an edible is not determined by the specific strain used; all edibles, regardless of sativa or indica cannabis used, will take on a sedative effect. The strain is negligent due to the scientific processes behind metabolization, so don’t fall victim to false advertisement. The strain is not contingent upon the side effects, rather, the method from which you are medicating and the terpene analysis. Therefore, indica and sativa strains are not as important as the terpenes they contain. Terpene analysis is something we will be hearing a lot more about in the future. It would be a good idea to understand the components of the plant by means of terpenes, instead of our traditional binary system of indica or sativa. How do I know which method will work best for me? The main component to acknowledge when deciding whether smoking or eating cannabis will be your preferred method of consumption is recognizing that your body metabolizes the medicine at different rates. Your body’s natural functions will activate the cannabinoid receptors to metabolize cannabis at your body’s own accord. Experimenting both methods, by means of micro-dosing, will help to monitor the process effectively. Micro-doing, also known as the titration method, involves eating or smoking small, micro-doses of cannabis, more frequently, to maintain the therapeutic side-effects throughout the day. This is a great way to discover which method you prefer and familiarizing yourself with the method that works with your body’s systems naturally. It is easy to mistreat your symptoms or dose yourself improperly with medical marijuana since we all metabolize cannabis at different rates. Again, recommendations will not always be an accurate assessment of the strength or side-effects. Also, certain illnesses or ailments will require different routine methods with cannabis. As we experiment and research more, we will be able to identify which method of ingesting cannabis will specialize in treating certain conditions. As scientists continue to research, they will be able to identify which methods will induce appetite stimulation and/or pain relief, which method works best for nausea, insomnia, or anxiety, which method is suitable for epilepsy and diabetes, among a slew of other therapeutic effects. How do we avoid the inconsistencies in labeling? We all have preferences based on our lifestyles. It is very common for people to opt for an edible to medicate if they are in an environment where smoking isn’t an option. The responsibility of the distributors, then, is to assure that the edibles are packaged properly so the patient doesn’t participate in unwanted side-effects. One of the main problems with smoking marijuana and consuming edibles is the lack of regulation within the industry to ensure consistency. Distributors are not required to lab test their products before it is put into a dispensary. This is not only ineffective for the advancement of cannabis, but it is also dangerous to the consumer. The consumer is then expected to rely on the quality and truthfulness of a distributor, whom in many cases are not holding themselves to the highest standards or cutting corners out of disregard and laziness. If quality is not a priority then dosing will become a more complicated task, rather than a medicinal experience. In order to properly dose yourself when ingesting cannabis, it is very important to check the lab test results. This will give you a more precise way to ingest the desired milligrams you are looking to consume or smoke. If an edible is labeled improperly this can lead to unwanted side-effects which will, in many cases, deter consumers from eating edibles in the future. Lab tests will also give us clarity when deciding how we want to consume medical marijuana. The most frustrating part of the medical marijuana industry is that patients’ have questions but are often left without answers. The amount of legal funding on medical marijuana research and the clinical trials in the U.S. is rudimentary in comparison to any amount of research that has been invested in prescription or OTC drugs. We will need to completely deconstruct the way we distribute marijuana if we are going to use it medicinally. We need to hold ourselves to the highest standards within the field to truly benefit from this new market completely. Patients should be able to rely on dispensaries to provide them with quality medicine, coupled with the lab test results of the product. This needs to be the next step in our advancement in the industry; if there isn’t honesty or transparency within the industry, then it will be counter-productive to the patients’ experience and a disservice to their medical needs. There are a lot of clinical research studies that have been conducted without addressing the results to the consumer. There are a lot of inconsistencies from edibles to packaging. There are a lot of severely sick people that are searching for a means to live life peacefully. This is why it will be of the utmost importance to hold your medical marijuana physicians and dispensaries to the highest standards. There are a lot of unanswered questions that should not remain a mystery. The mystery that lies within these processes’ will hopefully be addressed in the near future, as the legalization of medical marijuana will be in full effect in many states within the coming years. We can expect a lot of new strains and products on the market, but as consumers, we must demand more transparency within the industry and full analysis of cannabinoids and terpenes in all cannabis products. This will be the most purposeful method to using cannabis medicinally, which will make the legalization of marijuana one of the most significant legislations that will be funded in the coming years. “Marijuana: Gateway to Health.” Werner, Clint. San Francisco, CA. 2011.